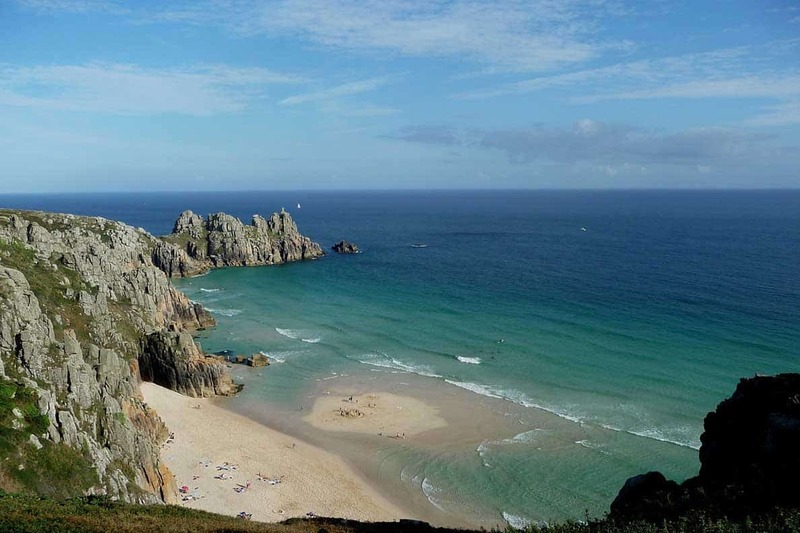 Looking for the best places to see on a Cornwall Road Trip? (Technically, it's a Cornish Road Trip… but let's not complicate things!! :)) We loved exploring Cornwall in our Motorhome and there were so many beautiful places to visit and things to do. Here are some of our favourites- along with a handy Map of Cornwall so you can plan your own trip! Some places are world-famous, others are very well-kept secrets that you don't often hear about until you live there… ssssh! 1. Tintagel Castle and Merlin’s Cave- every good Cornwall Road Trip needs to include this! 26. Bude- Cornwall's best beach? 32. Bodmin Moor- road trip to Cornwall legend! 35. Lusty Glaze Beach- one of the best Cornwall Beaches? 38. Jamaica Inn- worth a road trip to Cornwall! Day 4- Land's End/ Sennen, then back to St Michael's Mount and Minack Theatre. Stayed at Sennen campsite again. Day 7- Bude beach and drive home. Here's a map of the places we visited in Cornwall during our 7 day Road Trip. As you can see, we didn't do ALL 50, and that's ok. It gives us a reason to come back again!! Now, this is more like it! A castle which looks like a castle- and you can walk inside. You can walk out to the castle and back at low tide- just be careful about the tides as the water flows in very fast. If it's not low tide, there's a boat which you can take to get out and back. We actually chose not to visit St Michael's Mount inside, so we could visit Minack Theatre on the same day, but my parents have been and they say it's well worth a visit, so I guess we'll have to go back! St Michael's Mount- created by the same guys who did Mont St Michel! This was one of the biggest surprises for us. We didn't know what to expect and when we saw where the motorhome parking was (at the bottom of the cliff) we were so close to not bothering. But boy are we glad we did!! It's SPECTACULAR- and so unique. There are signs everywhere saying no drones… but we went back to the beach below and flew it over the sea, which allowed us to get some fantastic photos, as you can see in the video at the top of the post! It is still a working theatre, and you can view a play there- just make sure you book up well in advance as it's very popular! You can't go all the way to Cornwall and NOT go to Land's End. It's a long way to drive, I know, but such a beautiful place. This is where Jade decided she'd quite happily go swimming… as the waves are crashing against the cliff!! Crazy girl. (She didn't, in case you were wondering. That sea is COLD!) I love the fact that the year is changed on the Land's End post so it always shows the right year in your photos! It's hard to believe that this beautiful village is one of the main gathering for witches in the UK, but it's true. It has a great witch museum, which is touristy in parts but really interesting in others. Boscastle has endured horrendous floods twice in the last few years, with the worst being in August 2004. Waters reached over 2m deep in some places- you can see the markers on the buildings as you walk around. It's incredible that no-one died. Our favourites were the ice cream and the incredible pottery factory, which sold some beautiful and unique pieces. I'm a sucker for a good steam railway, but honestly, this one is more geared towards younger children. However, there's also crazy golf, canoeing and playparks, so it's a great day out to get them exhausted! St Ives is exactly what you expect from a Cornish town- beautiful, quaint and with a couple of incredible white sandy beaches- possibly the best in Cornwall. However, it also has the downsides you expect from a Cornish town- it's a NIGHTMARE to park and gets incredibly busy in the summer. There is a park and ride on the top of a hill (which tolerates motorhomes during the day but doesn't encourage them). Don't expect to be able to park near the beach unless you get there first thing in the morning; even then I think there is now a waiting limit on the parking of a few hours. Still, it's definitely worth a visit- the harbour and the beaches alone are worth the effort. If you like museums, the Tate St Ives art museum is well worth a look. Even if you don't the views from the gallery are spectacular or you could always enjoy an ice cream and sun yourself on the beach for a few hours! I love Falmouth. It's one of the places we stopped for a few days when we sailed our yacht around Cornwall many years ago. It's a big city, but everything feels very ‘seaside resort' and relaxed. It's the third deepest natural harbour in the world and there's so much history to explore- if you get a chance, visit the area for at least a couple of days so you can try to see everything. Your Cornwall Road Trip should definitely include a castle or three! This now has 3 floors and 12 exhibitions, so it's not for the faint-hearted or as a quick ‘looksee', but if you are at all interested in the sea, naval history, the history of the boat or want to sail model boats on the lake inside, it might be just the place. Sunsets in Cornwall are Spectacular! In Truro, just outside Falmouth, you'll find Skinners Brewery– an award-winning producer of pale ales and bitter. You can book a tour, enjoy an evening of live music, or just sample some of their famous brews! Falmouth has some beautiful hotels overlooking its harbour or the surrounding area. Here are a few to choose from if you're driving instead of touring in a Motorhome. This is a lovely way to see more of the coastline from the water and is a great trip on a calm, sunny day (I wouldn't advise it if the weather is bad- being on that sea in a storm can be miserable- I speak from experience!!) You can take a ferry from Mevagissey to Fowey, which takes about 40 minutes and runs daily from April- September, weather permitting. In 2018 returns cost £14 and cycles were £8. Well-behaved dogs go free! Mevagissey- impossible to pronounce, but worth a visit anyway! A giant green grass head awaits you in Cornwall! It's the most southerly point in the UK and it's beautiful if you catch it on a nice day. There are some lovely coastal walks and the wildlife is stunning. But then, that's true of most of Cornwall. As ex-Naval aircrew who used to be based down in RNAS Culdrose, I get quite excited by the Lizard (we did all our navigation training using the Lizard as a reference point!) But honestly, if you're going to any of the other cliffs on your Cornwall Road Trip, it's probably not worth your time unless you REALLY want to visit the most southerly point in the UK. The Lizard is a National Trust property- click here to find out more. Who wouldn't want to climb Brown Willy…..?!?!?! (oh go on, I know you're smiling at that one! I couldn't resist putting this just before the fertility hole below…..!! ) It's Cornwall's highest point, which I know isn't saying much, but it's a nice stretch of the legs on a summer's day and the views from the top are magnificent. WHY oh why do people pile stones on top of each other?? Never fear- you can see stone piles on your trip to Cornwall. This is one of those fun things that is STILL on our list, as we didn't get a chance during this visit. This stone is thought to be from the Bronze Age, making it around 3,500 years old. There are actually 4 stones in the area, but only one has the hole through the middle. Passing through this hole is said to aid fertility, both for women wanting children and farmers wanting crops… who am I to argue??! Anyone seen Outlander?? Maybe you shouldn't touch this…! Bude is right on the border between Devon and Cornwall and is on the North Coast, which is the best side for surfing if that's what you're looking for. The nightlife is much more relaxed than at Newquay and there are plenty of outdoor activities to keep you busy, including a sea pool cut into the rock at Summerleaze Beach. Bude has twice been voted best UK Coastal destination- so it does get busy during the summer. A girl walks on a beach in Cornwall, silently begging for the photographer to hurry up as she's FREEZING! I'm a sucker for bizarre and crazy things (have you checked out these BIZARRE European traditions??) but silver ball hurling may be the craziest yet. It happens once a year in early February and…well… I'm really not sure I can explain the rules. Shopkeepers barricade their doors and windows and thousands of spectators flock to watch fully-grown men fight for a ball and try to get it…somewhere. The ‘pitch' is about 20 square miles, making it the largest pitch for any ball game in the world. Now there's a fact for the pub quiz! Beautiful beach with lots of sand, and a great arch for your Instagram photos. After all, if it's not on Instagram, did you even really go??!! A hole in a rock. What more could you want from your Cornwall Road Trip itinerary?? Cotehele is one of my favourite National Trust properties. It's a medieval house with some Tudor additions- and it's really beautiful. There is also Cotehele Quay which has ‘Shamrock', a Victorian sailing barge, and a beautiful tearoom right on the river. Talking of ziplines, this one looks AMAZING!! It zips you 490m across a quarry, over a lake and through/ over various vegetation, at speeds of up to 40mph. There are twin zip-wires, so you can race your friend! Apparently, they've had riders as young as 3 and as old as 90- sign me up!! At Adventure Quarry, there is also a wipeout Aqua Park, coasteering, a giant swing and axe throwing. I might just move in! If any Road Trip doesn't include something death-defying, I consider it a failure. Anyone else?? This is said to be the pool where the lady of the lake resides. Apparently, it was here that King Arthur received his sword, Excalibur. The pool was once thought to be bottomless, but sadly it's become much shallower in recent years. In 1976 it dried up completely!! Bodmin Moor is definitely the stuff of legends. Wet, windy and wild, it's the highest part of Cornwall, and if you can catch it on a good day it's spectacular. In 1983, a report was given to the police of a ‘wild beast' said to be haunting the moor, with ‘sharp teeth like those of a leopard'. Those reports still continue today- that's one old beast! There is another ghost said to haunt Bodmin Moor- the ghost of the murdered girl Charlotte Dymond. Could be a crowded moor to visit if all the ghosts arrive at once! While you're at Bodmin Moor, visit the nearby Golitha Falls. If this isn't a place which can convince you of fairies and magic, nothing will! I couldn't not include a beach with a name like Lusty Glaze Beach!! This beach near Newquay is privately owned but you can visit for free. The high cliffs give it some great protection and it offers a huge variety of activities including climbing, abseiling, a restaurant and a creche! Dogs are banned from May-September. The beach can be accessed at low tide by walking around the headland, or reached by many, many steps (368 apparently! ), so plan accordingly! The Eden Project is a funny place. Despite living so close to it for years, I never ever wanted to visit. I always imagined it to be like walking around an enormous garden centre… why would I pay to do that? However, it turns out that I'm wrong. (Shocking, but true!) Apparently, it's a brilliant place to visit, with different sections showcasing jungle, desert and other diverse settings. But the two things which really swayed my opinion is the fact that big bands regularly play there (think Blondie, Bryan Adams, Muse and Tom Jones!) Also, there is now a zipline. I love zip lines. They're awesome (in case I didn't make that clear above!!). So the Eden Project is now on my list. You can visit giant balls of bubble wrap on your Cornwall Road trip!! This is a breath-taking Victorian country house. Seriously, there aren't many estates left like this one. It's another National Trust property, with plenty of activities taking place throughout the year. Cornwall's most famous smuggling pub. Located high up on Bodmin Moor and made famous by Daphne du Maurier, Jamaica Inn has been there for over 300 years, welcoming weary travellers. Apparently, it's haunted too- so I'll let you decide if you want to stay in one of its 36 bedrooms! There is also a museum and a restaurant. One for the kids or a rainy day, but this theme park will put a smile on anyone's face. There are rides, exhibitions and indoor attractions- perfect whatever the weather! Restormel Castle is a 13th Century Castle built in a circle which is in remarkably good condition! Open from April-October, it's a beautiful place for a picnic, with stunning views over the surrounding countryside. Another English Heritage property. And an extra one- just because I like you! We highly recommend joining the National Trust and English Heritage– even if it's just for a month if you're visiting from abroad. They will save you a lot of money if you visit more than one property and the money goes to a great cause- protecting our Nation's heritage. Lastly, don't forget that there aren't any motorways in Cornwall. The roads are small and can be very (very!) busy, especially in summer. Plan accordingly and don't expect to be driving at 70mph anywhere. The weather can also turn quickly, going from warm and sunny to raining and foggy. Be prepared for all eventualities, whatever the weather forecast may say!! Most of all, enjoy your Cornwall Road Trip! It's a stunning part of the world and I hope you have an amazing time. Let me know how you get on. Wow! What a great road trip with some amazing places to see and things to experience! I’ve always heard wonderful things about this part of England. Time to make that trip! Hope you make it one day- it really is beautiful. This is a great itinerary. I always forget just how big Cornwall is. I have only done St Ives and Lands End so looks like I will need to go back and plan another trip. We got so close to St Michael’s Mount but never saw it which is a shame. Oh no! How sad to get so close and not see it. Hopefully next time! We missed visiting Cornwall on our last trip to the UK. Perhaps next time. This will surely come in handy. Great post and super helpful! Hope it helps when you finally get there! Wow, this really inspires me to return to Cornwall. I’ve had some fabulous trips there in the past but for some reason I’ve been nipped across the border into Wales more recently instead of heading down to the southwest. Must make my way back in 2019. So much inspiration for new places to try – and a happy reminder of just how much I love Perranporth. I know- we loved Perranporth too!! But we also love Wales, so I understand your predicament!! I love your way of writing, put a smile on my face. And that sunset picture, OMG you really wouldn’t think that was in England! Really enjoyed this post and it does make me want to visit Cornwall, my in-laws went last year and really loved it too. Thank you- I appreciate that. 🙂 I hope you make it to Cornwall soon! I’ve been to England several times, but I haven’t had the chance yet to make it to Cornwall. I’ve always heard such amazing things about that part of England and now I know why. It looks incredible! I’m definitely saving this for when I can visit the area. I didn’t know there was so much to do in that area. Thanks for sharing! You’re welcome- hope you get to visit one day. Nooooo!! You need to go next summer- May/ June is good normally. I hope you get there too- it’s a gorgeous part of the world.